This was our last day on safari and we were spending it at one of the most exciting parks in East Africa. 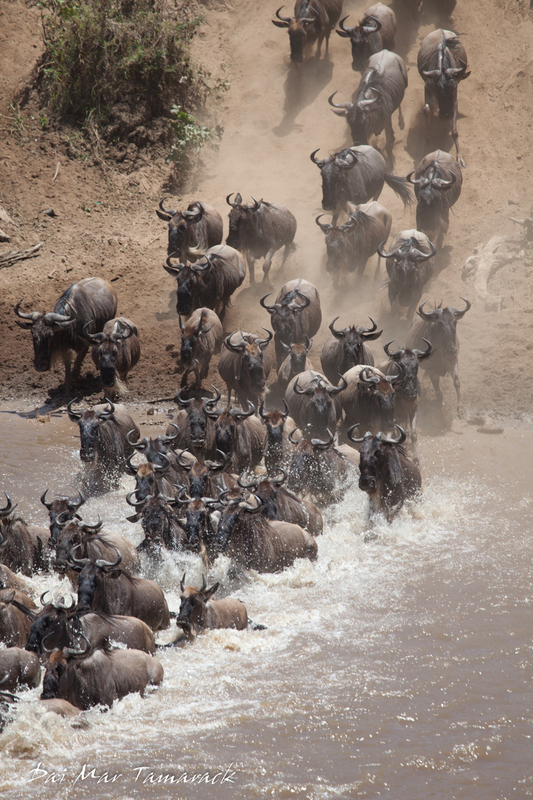 Known as the jewel of Kenya, the Masai Mara National Reserve is the continuation of the Serengeti plains of Tanzania. 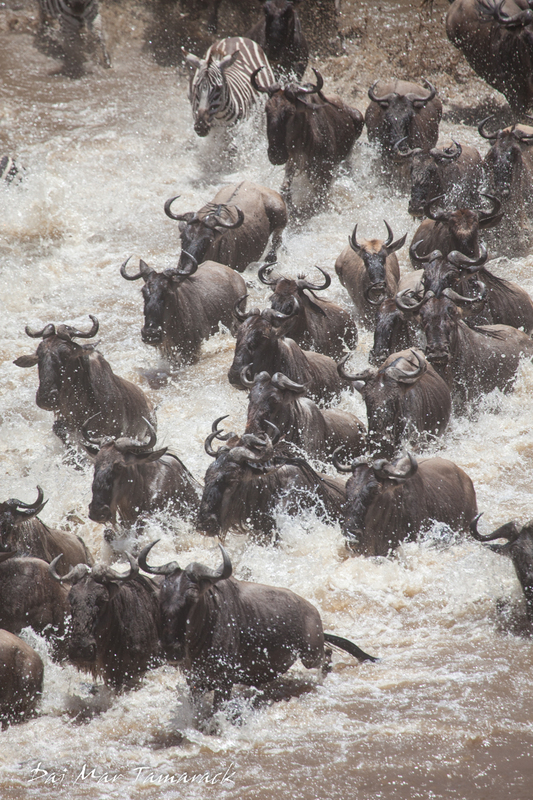 It is also the home to the Great Migration. 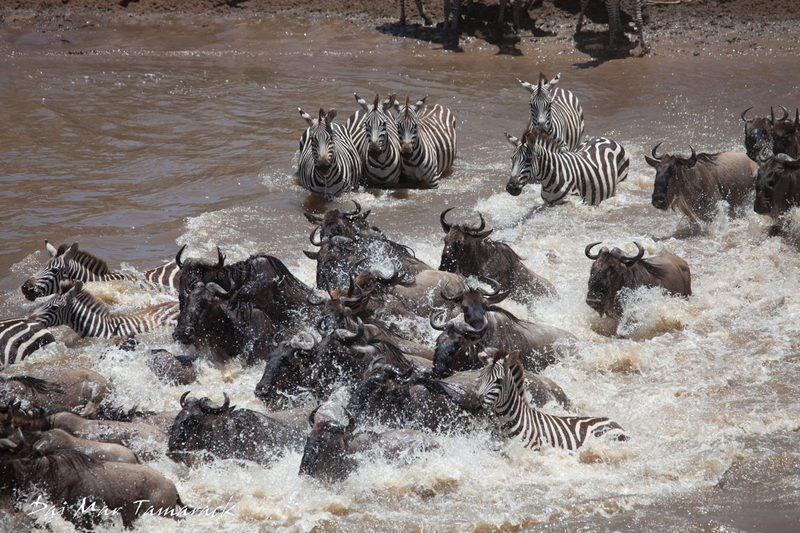 This migration of millions of wildebeests, zebras, and antelope plays out in one of the most exotic ecosystems on earth. 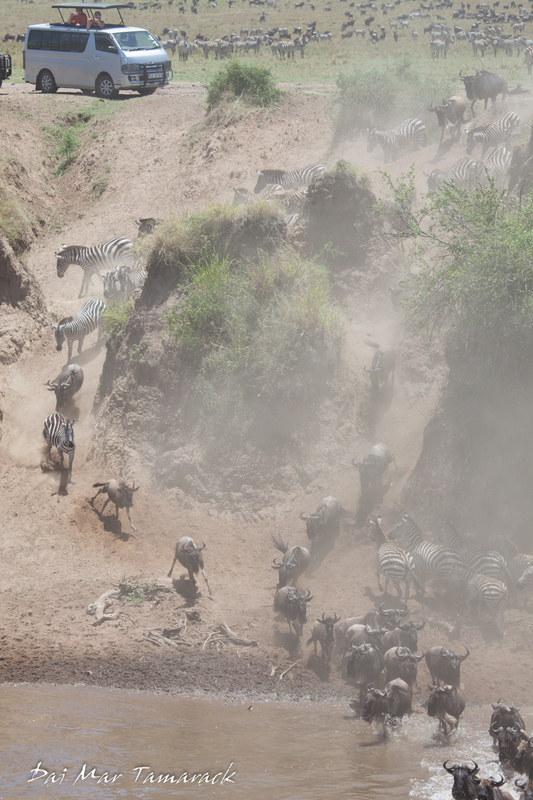 Seemingly endless lines of some of Africa's most resilient animals follow the rain and green grass in a treacherous circular route. Along the way they must sustain themselves, fend off attacks from Africa's biggest predators, and give birth to fuel future generations of migrators. To see this natural phenomena is a bucket list item that everyone should have but relatively few get to experience. 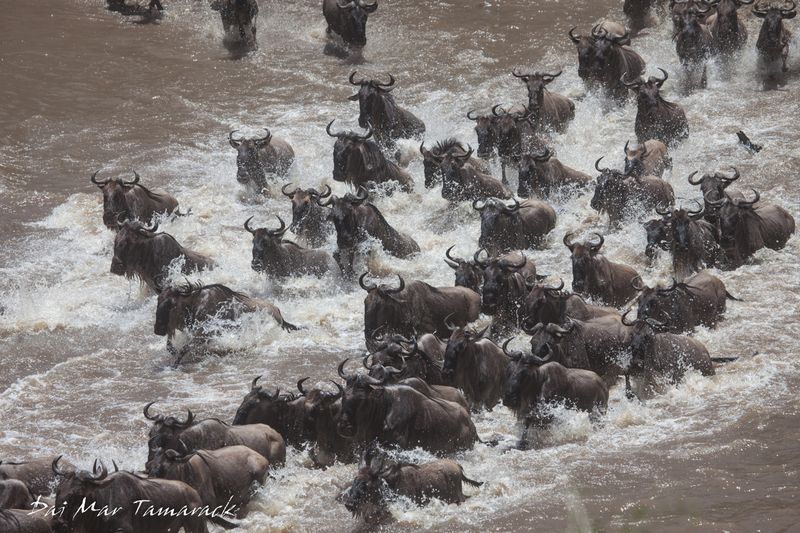 You have to time your trip to Africa, visit the right part of the Mara or Serengeti, and still get lucky. And lucky we were. On our last day Deedee, Becca, and Chris all got up at 2:30am to catch a ride for their sunrise hot air balloon trip. 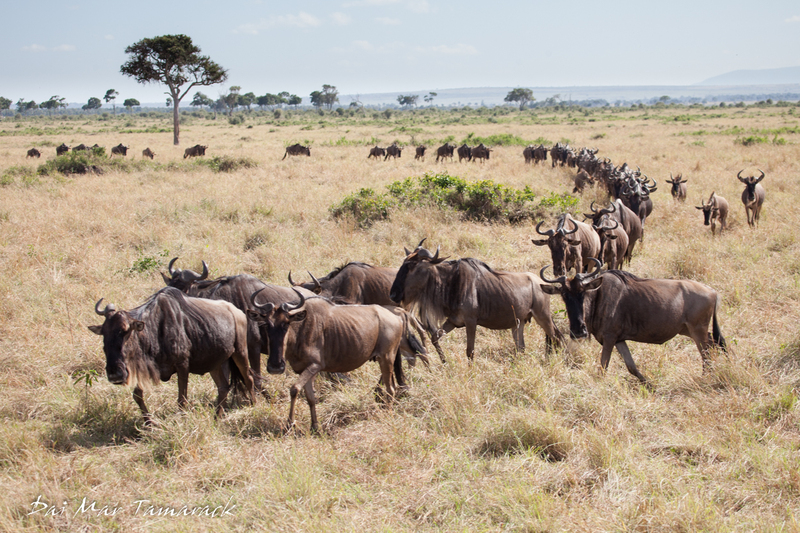 The rest of us had breakfast at camp then headed out through the reserve to meet up with them. The three ballooners were riding high after their trip and their champagne breakfast. 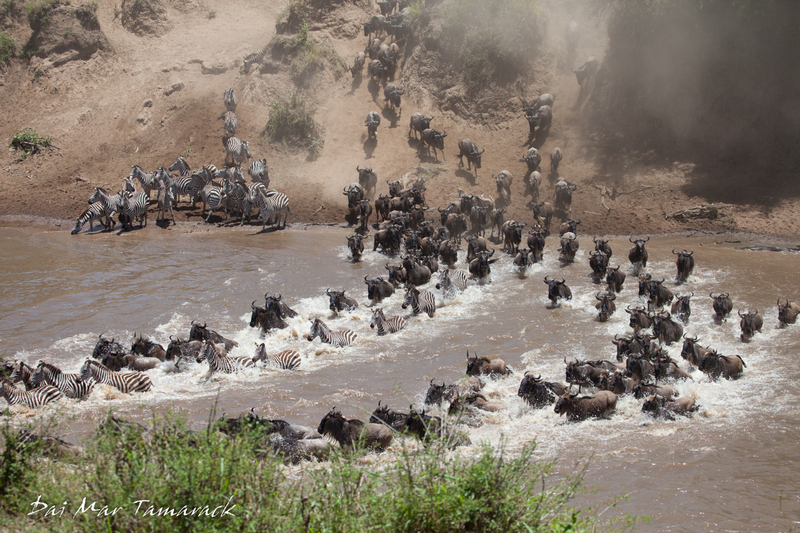 On the way to pick them up we had noticed a large amount of wildebeest and zebra gathering up near the Mara river. Could we possibly experience a river crossing on our last day? What where the chances? We gathered up a little ways back from the river where the majority of the animals were congregating. Other safari vehicles parked alongside of us, no one wanting to get too close and scare the animals into not crossing. We decided to settle in and wait and eat our packed lunches. Shortly after passing out the lunches a dust cloud kicked up by the river and all the vehicles took off, roaring across the ground towards the cliff overlooking the river. 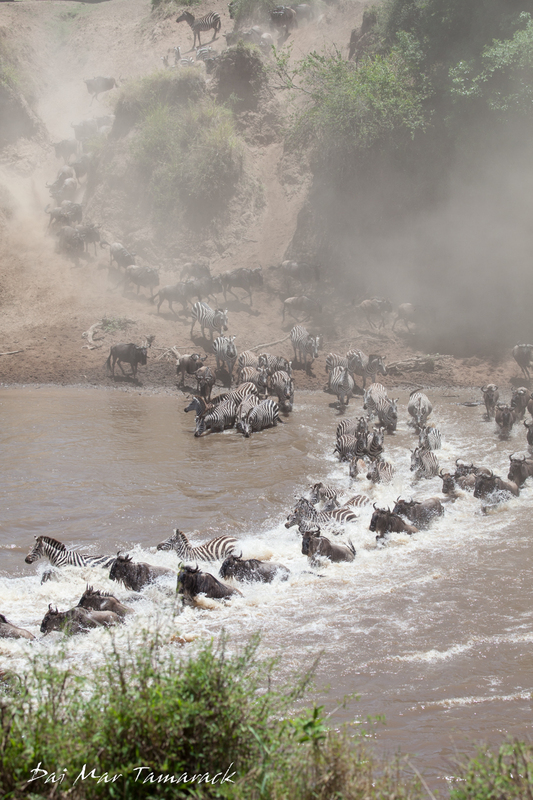 The first of the migrating wildebeest and zebra emerged from the river below onto our side. We were the fifth or sixth car so we ended up with a wondering view looking down into the river. 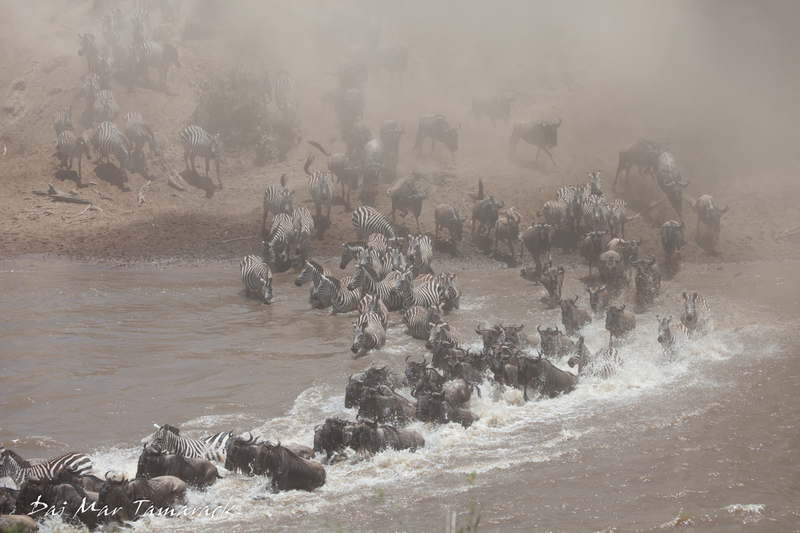 Hundreds....thousands of wildebeest and zebra charged down the far bank, racing towards the river. 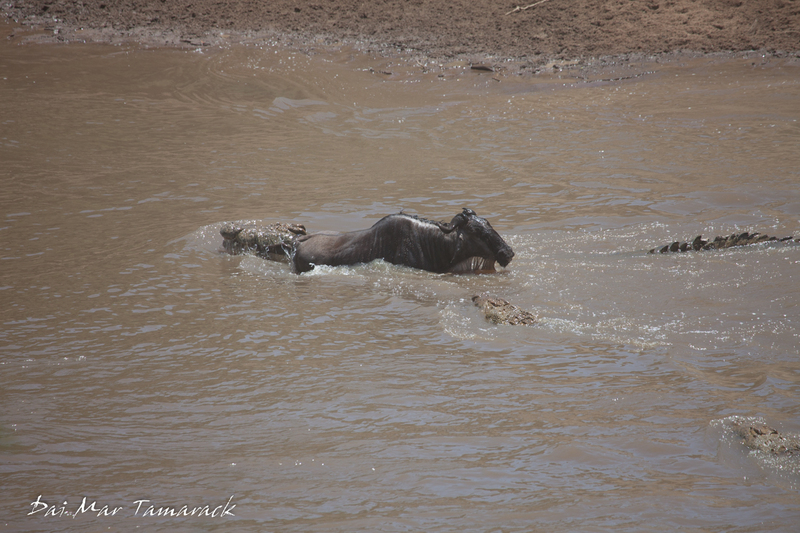 A huge croc, the biggest I've ever seen, snapped onto a full grown wildebeest and dragged it off downriver. 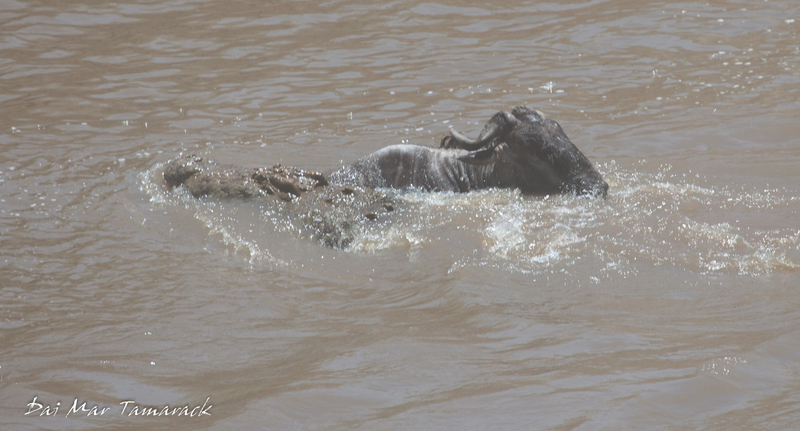 Other wildebeest raced past their downed comrade, bolting across the river to the "safety" and promise of green grass beyond. Little did they know what lie in wait on the far bank. Or maybe they did know and the instinct to come was just too strong. 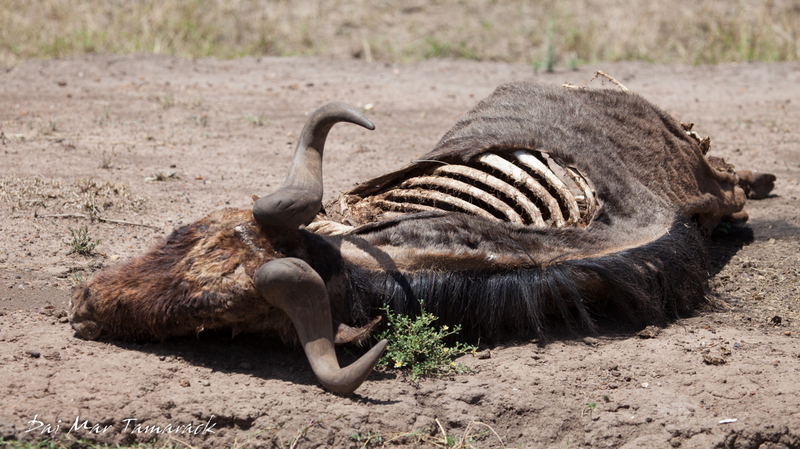 For one wildebeest the instinct failed him. Just as quickly as the migration river crossing started it stopped. Although it seemed like it stopped a little too suddenly. Some animals turned around and ran back up the other side, a few came up by us, and a dozen or so were just stopped in the river looking confused. 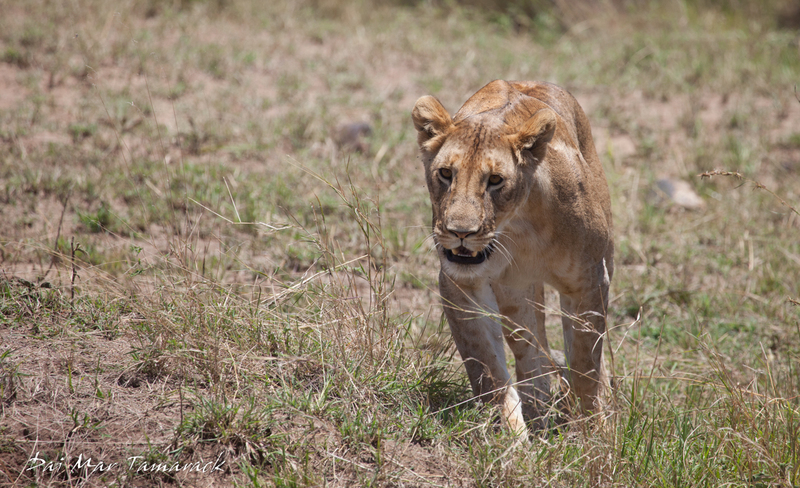 That is when an adult lion sauntered out of the shrubs in front of us. None of us had seen it coming. Apparently the wildebeest had. This is why they stopped crossing. 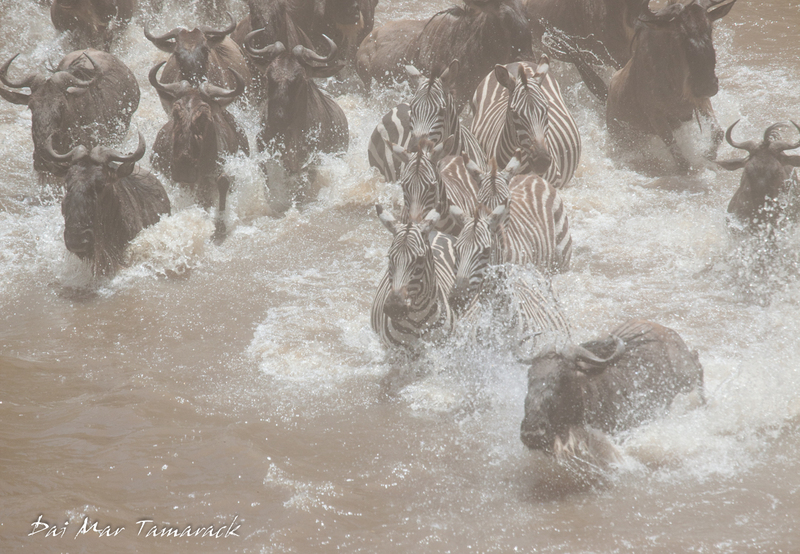 The lion stared hard down into the river where the last dozen sat looking like sitting ducks. 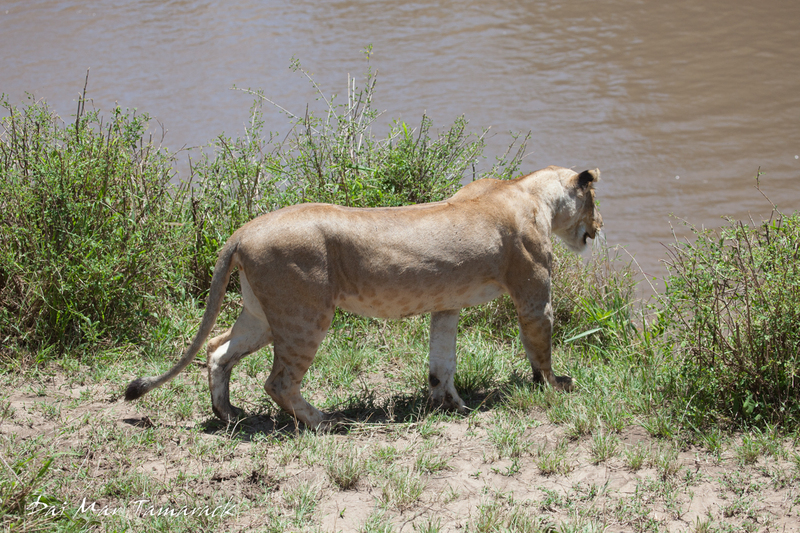 Then in a blur of a movement the lioness disappeared over the embankment. We heard an audible gasp from the people in vehicles on the opposite bank. We knew why a moment later. 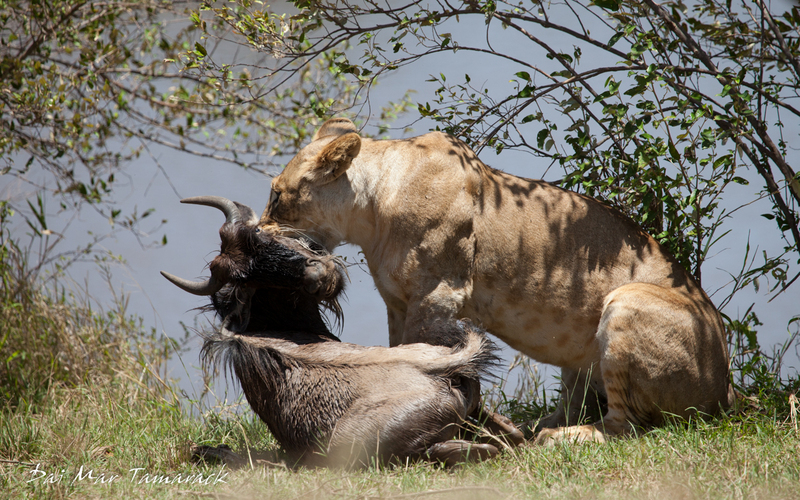 The lion came striding up over our side of the bank dragging a wildebeest in its mouth. It must have leaped right ontop of it, grabbing it by the throat. 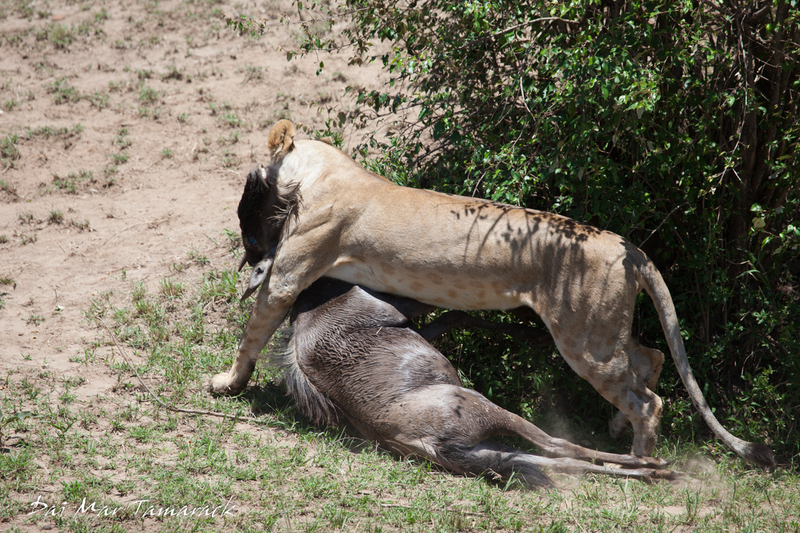 We watched the wildebeest idly struggle for a couple of minutes and then resign to its fate. 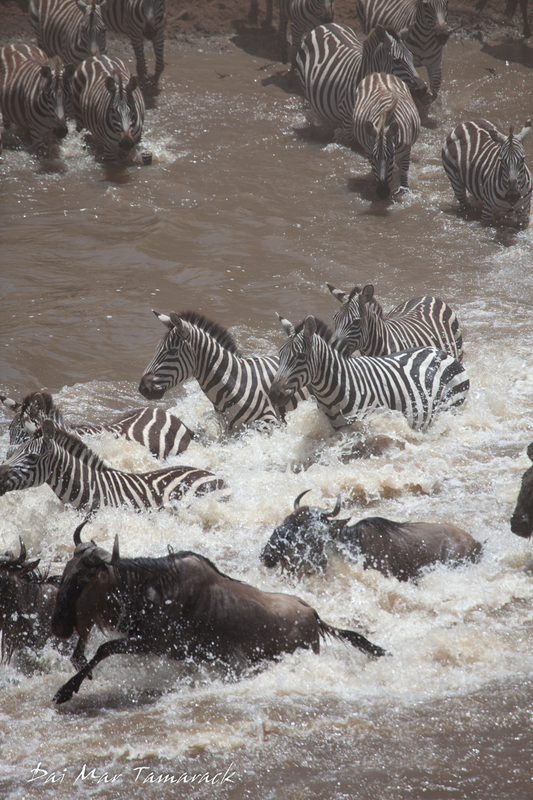 This river crossing had ended in spectacular African fashion. When imagining how this final day would go I could not have hoped for a better result. 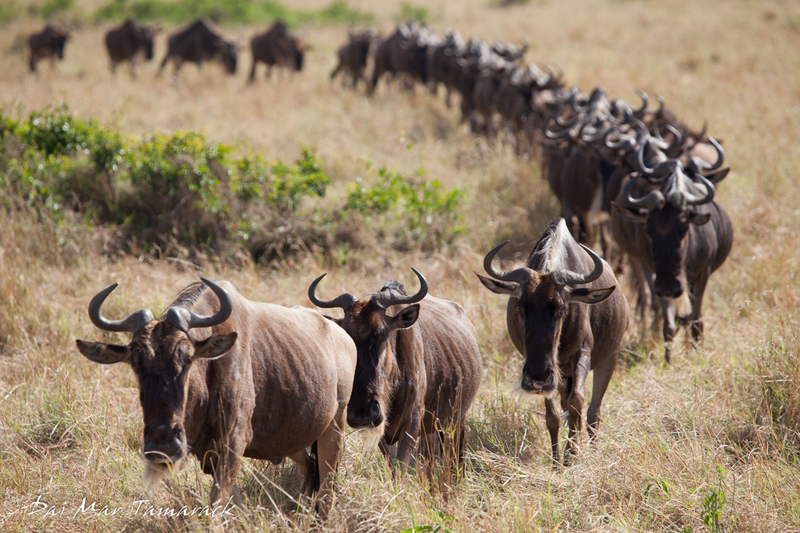 The circle of life and the great migration played out in real life right outside of our vehicle door. It is something the six of us will never forget. This is Africa.